I arrived at the historic firehouse in North Portland’s Kenton neighborhood about 20 minutes before the doors opened. A dozen people were milling at the top of the stairs leading to the basement, some quiet in the thought of weekend projects, others engaged in friendly banter. But what drew them here, each Saturday morning and Tuesday night? They came to share and borrow (free of charge) a variety of hand and power tools—for construction, for gardening, for building community. The North Portland Tool Library, Oregon’s first tool lending library, had set up shop in that basement, and the lure of the weekly assembly is exactly what inspired this community project. I used to live in Berkeley, California, near the Ashby BART station. Each day on my way to work, I would pass by the branch library, and some days there was a crowd gathered around an adjoining shed. Curiosity drew me closer, and the closer I got, the more I learned about the Berkeley Tool Lending Library. To join this library, there were a few qualifications: you had to be a Berkeley resident, you agreed to a set of borrowing guidelines, and you had to hold a book library card. After you signed up, a wide range of tools were available to borrow, free of charge. Although I lived in a rental house, I was fueled by the excitement of this community resource. With my landlord’s OK, I built shelving inside the house, as well as garden boxes and a deck outside. The tool lending library was a great idea inspired by community activists decades before my own discovery of it, and it inspired me to dig and improve a house I didn’t even own. In 2001, after moving to Portland, Oregon, I enthusiastically shared the story of the Berkeley Tool Lending Library with my friend Laura Dalton as we kayaked along the Oregon coast. We wondered, “Could we start a tool library in Portland?” I was an organizer by trade, with experience in campaign, environmental, and union work. But I figured Laura, as a carpenter, could put some good practical tool-sense to it all, which she did. We secured fiscal sponsorship with the 501(c)3 organization North Portland Community Works and visited and did weekend internships at the Berkeley Tool Lending Library as well as the Temescal Tool Lending Library in Oakland. We were then awarded a $12,000 community development block grant through the city of Portland, creating a foundation for the North Portland Tool Library (NPTL). Laura and I recruited two more board members in North Portland (Matt Moritz and Jason Henshaw), hired a part-time tool coordinator, purchased tools (which we engraved and painted with ID numbers), and set up a system to track the tools in the firehouse basement. Where teams of horses and firemen had previously left the building to protect their community, NPTL was now sending out tools with residents to sustain North Portland’s diverse community. In these neighborhoods, home to a remarkable mix of populations, incomes, renters, and homeowners, we figured that access to free tools would lower at least one barrier to home and community improvement. 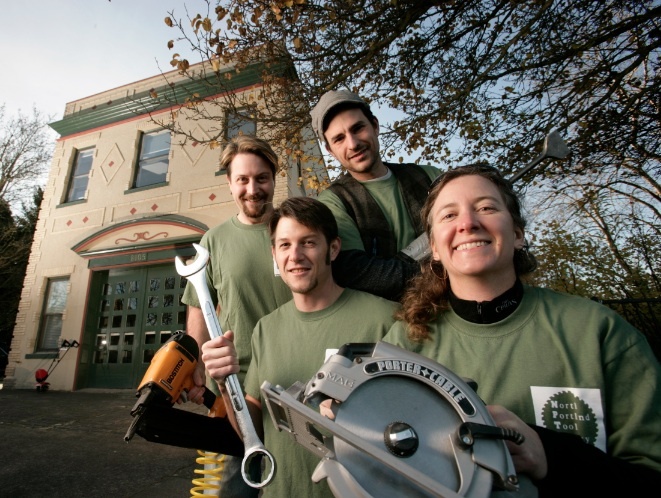 The doors of the North Portland Tool Library opened to four North Portland neighborhoods in October 2004; 16 people signed up, and some 20 tools left the building. I truly wondered during the course of that week, would those tools return? They did. And they’ve continued to return. When one borrower had a drill and a miter saw stolen from his car, he bought replacements before the stolen ones were due. A house fire claimed most of the possessions of another borrower, but when his homeowner’s insurance came through, so did replacement tools for NPTL. Laura developed tool safety and other workshops to help borrowers use the equipment and expand their skills. Today, with more than 2,500 registered members, hundreds of tools, and service to all North Portland neighborhoods, the NPTL has no express lane. And frankly, that’s all right. People waiting in line have an opportunity to talk with their neighbors. We had envisioned the modern-day equivalent of community barn-raising, and it was happening. One time, two borrowers were waiting in line to get a prized extension ladder. As they moved closer to the front desk, they discovered they were both working on roofing projects, so they swapped ideas, shared that ladder, and ultimately exchanged labor. That was community building for us. Borrowers have gone on to maintain their homes, maintain their yards, and even build new housing…for chickens. I’ve had people tell me about “this tool library in North Portland,” brimming with the same enthusiasm I enjoyed when I first discovered the concept more than 10 years ago. Tool lending is a borrowed idea that has inspired two additional tool libraries in Portland, and many others throughout the country. Although we drew on the experience of tool libraries in Berkeley and Oakland, we also looked to examples in Seattle and Missoula. It’s a great idea. It’s about sharing what you don’t need to own. It’s about sustainability. It’s about being creative and resourceful. And in some way, it can make cities smaller and build community. Borrow this idea. Check out New Dream's video and webinar on how to start a tool library in your community! Jason M. Hatch, the founder of the North Portland Tool Library, is President of North Portland Community Works, a 501(c)3 fiscal sponsor for more then 10 community projects in North Portland. He works in water conservation in the Pacific Northwest.